Robert Ingersoll was a regular customer of Arlene’s Flowers. During the past nine years, Barronelle estimates she sold flowers to Robert at least 20 times. They also became fast friends; Barronelle says, “[h]e has a very creative mind and we just kind of hit it off.” Barronelle knew that Robert was gay, and some of those floral arrangements were for Robert’s partner, Curt Freed. Bob Ferguson is the Attorney General of Washington. After communicating her regrets to Robert, Barronelle referred him to several other local florists and the two continued to chat about Robert’s wedding plans. Before he left the store, they embraced. Robert and Curt had no trouble finding another source for flowers; in fact, they received several offers for free flowers. While no formal complaint was filed with the State by the couple, Attorney General Ferguson heard about the matter and filed a lawsuit against Barronelle, accusing her of unlawful discrimination in violation of the Washington Law Against Discrimination (WLAD) and Consumer Protection Act (CPA). This was the first time that the Attorney General’s office has sought to single out and punish a private citizen under the CPA. The ACLU was quick to follow suit, and filed a lawsuit on behalf of Robert and Curt. Notably, both the ACLU and the Attorney General’s office filed suit not only against Arlene’s Flowers, but against Barronelle personally. Barronelle thus found herself at risk of losing not only her business, but also her home, her entire life savings, and everything she owns. Barronelle’s attorneys plan to appeal. 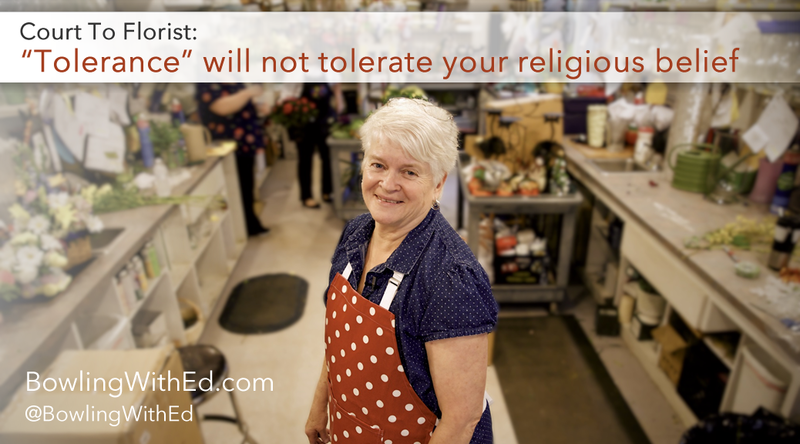 What the court failed to acknowledge in its conclusion is that aside from the state’s intolerance of her faith, Barronelle is also being asked to create artistic expression that she disagrees with. This too violates the First Amendment. The Supreme Court has held not only that First Amendment protection extends “beyond written or spoken words” but also that the freedom of speech “includes . . . the choice of what not to say.” Hurley v. Irish-Am. Gay, Lesbian & Bisexual Grp. of Bos., 515 U.S. 557, 569 (1995); Pac. Gas & Elec. Co. v. Pub. Utils. Comm‘n, 475 U.S. 1, 16 (1986) (citing Miami Herald Publ‘g Co. v. Tornillo, 418 U.S. 241, 258 (1974)). Unless the appeal is successful, Barronelle faces the loss of everything she owns—her business, her home, her entire life savings, and other personal belongings. All because she made the principled choice to live—and create expression—in a manner consistent with her religious beliefs, a foundational freedom Americans have always enjoyed. There are at least three separate ironies to the state and ACLU’s oppression of Barronelle. Share Barronelle’s story on Facebook and Twitter. First, the law that is being used as a sword against Barronelle exists, ostensibly, to protect Washington’s citizens from unlawful discrimination. Yet the result of this prosecution has been a ruling that Barronelle’s Christian faith—and rights of expression—are incompatible with her private business, and that her religious convictions and expression will not be tolerated. In the meantime, Robert Ingersoll and Curt Freed easily obtained flowers from another vendor for their wedding—the court’s ruling notes that Ingersoll and Freed incurred a whopping $7.91 in mileage costs related to their efforts to select an alternative source of flowers. Third, it seems that some of the very individuals the Attorney General purports to be protecting by his dogged prosecution of Barronelle may in fact oppose his efforts to do so. Barronelle also says she has received many cards, emails, and calls from those who identify as homosexual and support her right of free expression and religious freedom. Just two days ago, Secretary of State John Kerry referred to the administration’s efforts to “reaffirm the universal human rights of all persons.” He stated that “[d]efending and promoting the human rights of LGBT persons is at the core of our commitment to advancing human rights globally – the heart and conscience of our diplomacy.” Nowhere, however, did Secretary Kerry reference religious liberty, or the plight of individuals like Barronelle. Just last week I blogged about former Atlanta Fire Chief Kelvin Cochran, who was fired because he dared to express his Christian faith. Elaine Huguenin of Elane Photography in New Mexico, Jack Phillips of Masterpiece Cakeshop in Colorado, and Brendan Eich, founder and former CEO of Mozilla Corporation, have also faced serious repercussions for exercising their freedom of conscience, freedom of speech, and/or free exercise of religion. And there are countless others. Religious freedom, freedom of expression, and freedom of conscience can no longer be assumed. Thankfully, people like Barronelle seem determined to make sure it doesn’t fade away with a whimper. *Stands and claps* Thank you for putting this into perspective and exposing the insanity in the erosion of rights that once meant something in this country.